1. If you do find a golden conure for sale, keep in mind that it is illegal to sell them across state lines in the United States without a special permit. The permit needs to be obtained through the U. S. Fish and Wildlife Service. Both you and the seller are going to need this permit. While it may seem easier just to buy a bird in-state, finding one available could be difficult. 2. 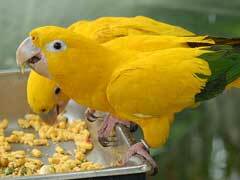 Golden conures as pets are rare because the birds are highly protected. Because they originally live in Brazilian rainforests which are rapidly being destroyed and because they are frequently taken illegally out of the country to sell, the birds are being protected so they don’t become extinct. 3. These yellow birds breed well in captivity. Breeding programs have been established in many zoos and other organizations to help keep the birds’ numbers up. Most of the birds bred through these programs are not sold to individuals. 4. Although called the golden conure, not all of the bird’s feathers are yellow. The feathers they use while flying are a beautiful shade of green. 5. The birds are highly social. In the wild when their numbers were more plentiful, they could be seen in groups of up to 60 birds. However, the farmers in Brazil viewed them as a nuisance and sometimes killed them for food. 6. The golden conure is highly prone to feather plucking so you need to ensure they have lots of stimulation. Because they are highly intelligent, they can learn tricks very easily and this is the best way to keep them from becoming bored. 7. If you have one of these beautiful birds in your home, be sure to provide calcium and mineral supplements because they are prone to deficiencies. Although getting a golden conure in your home might be costly and difficult, they do make wonderful companions.